Use the Kinect to explore the world of tomorrow. Some people use their Kinects to play Fruit Ninja, some to control their Xbox dashboards, and some to wander through futuristic cities. 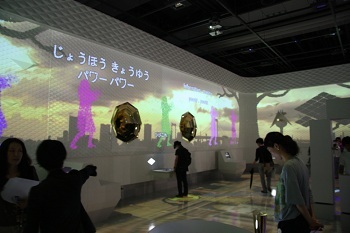 A new exhibition at the National Museum of Emerging Science and Innovation in Tokyo allows visitors to interact with a city from the year 2050 via Microsoft's motion-control device. The exhibit hopes to make museum patrons fully immersed in a world where scientific innovation is the key to a successful future. Here's how it works: "The Shape of Life in 2050" creates a virtual, 120 square mile metropolis known as "Itookashi City." Museum-goers get an augmented reality (AR) card, become a citizen of Itookashi, explore the city, interact with over sixty objects, and eventually make a decision about how to incorporate a new scientific or technological find into the city. Visitors control the experience via touchscreen and basic gestures with the Kinect. While the simulation is not exactly virtual reality, the combination of AR and actual movement aims to create a more immersive experience than a touchscreen and graphics alone. "The Shape of Life in 2050" is the latest in a long list of Kinect's non-gaming applications, but its real importance lies in connecting gaming technology with science education. When done correctly, motion controls can make a player more invested in a game. Science museums, particularly ones with hands-on exhibits, can spark an interest in technological learning. Combining these two ideas could be especially salient for young people with an interest in either topic. The exhibit is currently in previews, but will open soon. Those outside Japan will have to wait until another museum tries something similar or, even better, releases a similar experience for a home console.